The Day That All Moms Dread…..
Well, I knew this day had to come – it comes around every year. The day that all kids look forward to. and all mothers dread. 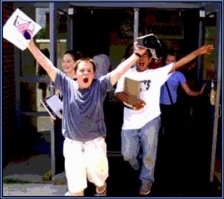 That’s right, folks – the Last Day of School is here…..
Oh, well – September will be here before you know it….. This entry was posted in Annual Posts, Contemporary, Family, Foodie Friday, Humor, Music and tagged Alice Cooper, School's Out, Staples Commercial. Bookmark the permalink.